This letter-learning game is good to go from head to toe. In the Dr. Seuss Super Stretchy ABC game, the challenge is to put hands, feet, and even ears on up to five letters at a time. Kids stretch, turn, twist and reach their way to a win, but the process is more important, and more fun, than the final outcome. Use it to add activity, and a bit of learning, to indoor play. This game is designed for two to four players, ages 3 and up (the pieces are too small for younger kids). It comes with an alphabet mat, tornado board, letter coins and cards, and toy boxes, and doesn't require any batteries. 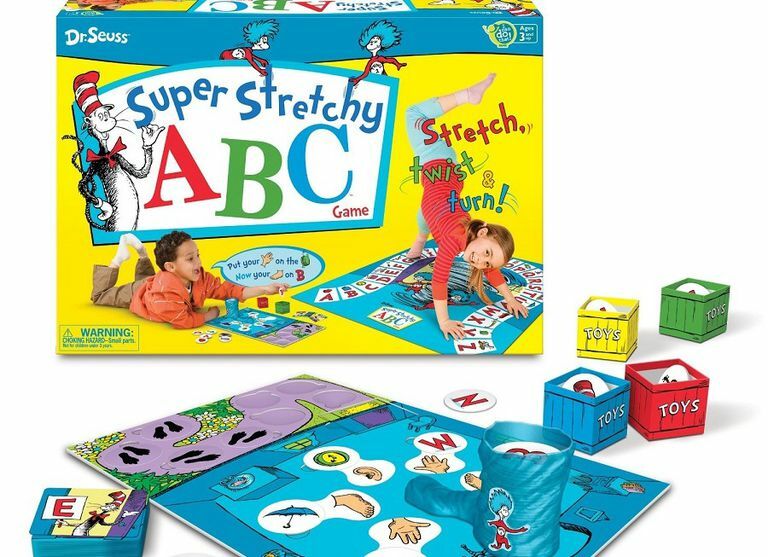 If your kids are more interested in Disney Junior characters, there is a Super Stretchy game for them too. It teaches colors and shapes instead of letters (Buy from Amazon). This clever twist on Twister quickly became a favorite with my two young testers, ages 4 and 7. The game is inspired by the book Dr. Seuss's ABC and features those two blue-haired scamps, Thing 1 and Thing 2. The premise is simple: The Things twirl up a tornado of letters (plastic coins) onto the game board, creating a challenge for players to replicate on the oversized plastic alphabet mat. Can they reach the letter C with one hand, the J with another, the F with a foot, and so on? My kid testers picked up on how to play easily and can play the game independently (a big plus in my book). Players take turns being the Stretcher, standing on the mat, or the Caller(s) that gives instructions to the stretcher. Since everyone has a role, players don't have time to become impatient or frustrated. Also, the game de-emphasizes competition and scoring. The Stretcher earns coins for each letter he can reach, but in the end, the winner is determined by chance—making a match with a secret letter card placed at the beginning of the game. My players didn't much care who won or how many coins they collected, and in fact, they would help each either twist and turn to reach as many letters as possible. The game helps children practice some important skills: letter and picture recognition, fine motor coordination, and gross motor skills. But it's done in a fun, interactive way; it's not overly academic. My 7-year-old tester is well beyond learning her ABCs, but she still enjoys playing. The game is made with nontoxic materials and is durable and attractive. We did find that the tornado tube, which dispenses letter coins into slots on the tornado board, had a tendency to spit out extra coins. We just put them back on the top and continued playing. Oh, and the vinyl mat sure does attract dog hair! But overall, we recommend this as a great addition to your game collection.